GSL Electronics designs and manufactures a range of affordable MPPT Solar Charge Controllers for use in off-grid applications. Why Use an MPPT ? The performance of photovoltaic (PV) solar panels can vary during the day, due to environmental factors such as the time of day and shading. Standard solar regulators allow the PV voltage to move away from maximum power while also requiring a good panel to battery voltage match. Maximum Power Point Trackers ( MPPT ) use clever algorithms to maintain the PV voltage at a level which maximises the power delivered to a load or battery, allowing a significant panel to battery voltage difference. When the panel voltage is significantly higher than the battery voltage an MPPT can efficiently be used. When the panel voltage is lower than the battery voltage a BMPPT (Booster) must be used. • Less interference and more accurate voltages during absorption and float. GSL Electronics' internationally patented software and unique board design reduces the manufacturing costs of our MPPT, allowing a breakthrough in MPPT price without compromising performance. Our wide range of MPPT Solar Charge Controllers allows you to match the right MPPT to your application, so you only pay for the features you need. 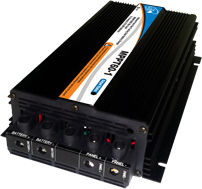 Our product offerings now include the new HV range which allows even higher input voltages from PV panels. Our MPPT Solar Charge Controllers are used for off-grid solar lighting, pumping and signalling applications. Generally they are used where solar PV panels charge one or more batteries (Lead Acid, Gel, AGM cells etc.). We have also developed units that charge Lithium Batteries. In some instances they can also be used where the MPPT directly connects to the device to be powered, such as a low voltage DC pump.